My dad is a tricky one to buy gifts for. He never says he wants anything besides spending time together. That’s all good and well but it’s hard to wrap up time. This past Christmas, to meet both the criteria of having something to open and gift an activity to do together, I gave him a Fandango gift card. 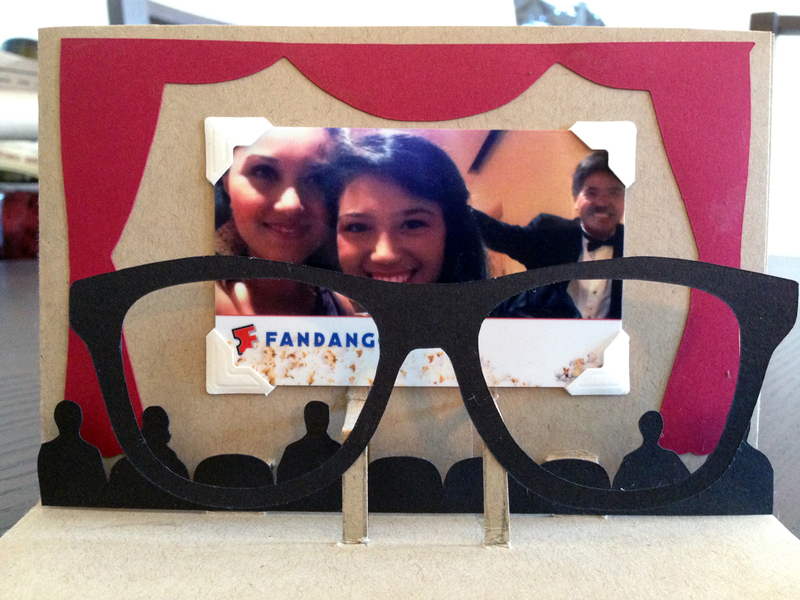 To give the presentation some flair (since gift cards are pretty boring), I decided to make a 3D pop-up card to represent going to a 3D movie. In October, my niece celebrated her first birthday. That same month, I found out that my CEO and his wife were also expecting a baby girl. So I decided sweaters were in order. The pattern I settled on was Summer Chills Cardigan by Danielle Reiner. It’s adorable, the pattern was adaptable to varying ages and it seemed like the perfect little baby sweater for cool San Francisco summers for these two little girls. I started with the sweater for my CEO’s soon-to-be baby girl, Evie. I used a worsted acrylic blend in white – soft enough for a baby and machine washable enough to actually let it be worn. I did slightly modify the pattern, but only in so far as…I do not know how to crochet. So I didn’t crochet the edges. I just left them bound off. Because I didn’t add the crochet edging, I also didn’t make a button hole. In the case of Evie’s sweater, I simply added two pieces of pink ribbon to tie the sweater together across her chest. I realize now that I think I shorted Baby Evie’s sweater by one lace repeat but oh well. Hopefully she’ll be a short baby! Before I had finished completed the second sleeve on the sweater, I took it over to size on my niece. I was making the 6-month pattern for Evie but it seemed awfully large for a 6-month old. I tried it on my niece at age 13-months and it was just about the right size. She isn’t a tiny girl either, so I’m not entirely sure why my sizing was so different from the pattern but it didn’t really matter as long as it would fit little niece-y pants. For my niece, I opted to use some FibraNatura Sensational worsted weight in red superwash merino. I had a few extra skeins left over from another project and I thought she’d look smashing in the color. A little over a year ago, I made an ornament for Boy’s sister using ribbons from her wedding and her wedding program. This year, though I sadly couldn’t attend the wedding, I have the pleasure of making a similarly styled ornament for my lovely cousin and her lovely now-husband. For a rough cut on how I made this (though you can probably figure it out from the photo), check out this post for the K & A wedding ornament. So often, crafting is about finding someone else’s project, loving it, and recreating it in your own way. In this particular case, my sister-in-law had attempted to purchase a dinosaur-themed birthday banner in girlie colors for my niece’s 1-year and 1-month birthday party (yes, we did celebrate one month late). Unfortunately, the Etsy vendor said she simply couldn’t get it done in time for the event. Sister-in-law emailed me with the photo of the banner she had wanted and asked if I could help create something similar. Since I love all things crafting and I have a Silhouette Cameo cutting tool, I knew it would be a snap. In this particular case, some sleuthing (i.e. Google image searches) showed that the dino designs actually came from the Cricut Create a Critter Cartridge. Now of course, I have a different cutting machine so I couldn’t buy that cartridge. But I am pretty handy in Photoshop and was able to create similar designs for the dinos to cut out on my Silhouette. I made the body of my brontosaurus face the other direction and gave her a longer tail…you know…for more realism… And here’s how it turned out! But you can whip them up quite quickly. You can find the pattern for Saartje’s Bootees at Ravelry. I used some 4 ply teal wool yarn I had lying around and a couple of random buttons and they came out wonderfully!